This article is about neighborhoods in the city of Atlanta, Georgia. For cities, neighborhoods, and other districts in Greater Atlanta, see Atlanta metropolitan area. 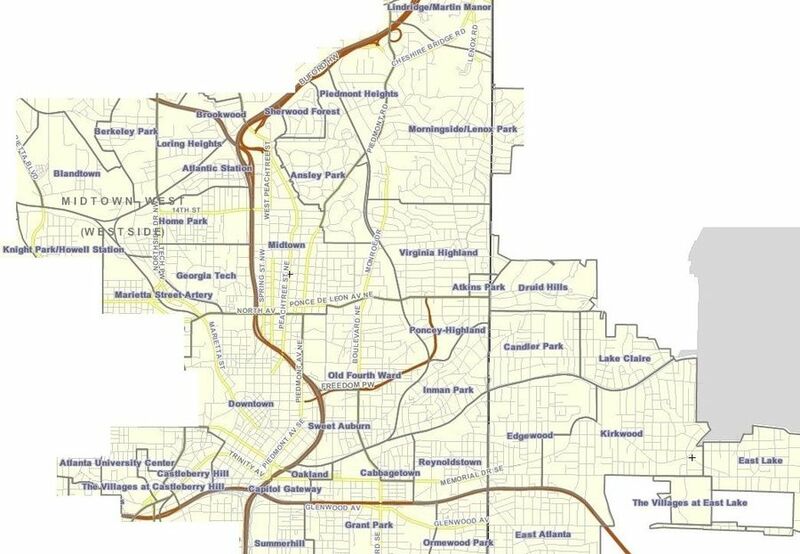 Note: many unincorporated communities in DeKalb County and Cobb County, Georgia adjacent to Atlanta, including Druid Hills CDP and North Druid Hills, both in DeKalb County and Cumberland, Georgia and Vinings, Georgia, both in Cobb County use "Atlanta" in their postal address but are not part of the City of Atlanta. See DeKalb County and Cobb County, Georgia. Also, an unincorporated area in Norcross, Georgia, located in Gwinnett County, uses an Atlanta postal address, while not being a part of the City of Atlanta. The American city of Atlanta, Georgia is divided into 242 neighborhoods officially defined by the city. These "neighborhoods" are a mix of traditional neighborhoods; subdivisions or groups of subdivisions; and parts of core areas such as Downtown and Midtown. The neighborhoods are divisions of 25 neighborhood planning units or NPUs, which are "citizen advisory councils that make recommendations to the Mayor and City Council on zoning, land use, and other planning issues". There are other non-official but widely recognized named areas within the city, such as Intown, West Midtown, Buckhead, and areas like Northwestern Atlanta identified by compass points. The term "district" in Atlanta is generally used for small areas within the official neighborhoods. Downtown and Midtown Atlanta each contain a number of districts. Another example is Little Five Points, which sits on the border of 3 official neighborhoods. In addition, Atlanta has various other divisions such as business improvement districts, police patrol zones, and in the unique case of Buckhead, a "community". Most of Atlanta north of the I-75 / I-85 downtown connector is part of the "Buckhead Community". Downtown, Midtown, and most of the central, east-central, west-central neighborhoods are referred to by their names, as these are well known throughout the Atlanta metro area, and most contain regional "destinations", such as the Zoo in Grant Park, or the shops and restaurants in Virginia Highland (other examples include East Lake, East Atlanta, Ormewood, Bankhead, Kirkwood, though they are not limited to these). 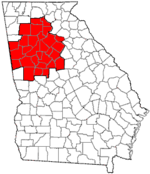 Other areas are generally referred to as part of either "Northwest", "Southwest", or "Southeast Atlanta". However, "East Atlanta" refers to a small neighborhood which is part of the 'W' group NPU and does not have the same connotation as the other directional descriptors. The term "intown" is more commonly used to refer to any neighborhoods within the central part of the city. The Little Five Points district is located where Inman Park and Candler Park meet. ^ "Neighborhood Planning Unit (NPU)". City of Atlanta. Retrieved 17 January 2017. ^ "Atlanta News / Georgia News Section". ajc. Retrieved 28 August 2017. ^ "Midtown Alliance". Midtownalliance.org. Retrieved 30 August 2017. ^ "Atlanta, GA : NPU by Neighborhood". Atlantaga.gov. Retrieved 28 August 2017.